A house loan repayment has two components – principal and interest – and both of these components are treated differently for tax benefit calculation purposes. The principal amount is covered under Section 80C and has a Rs. 1 lakh limit. In order to claim the tax benefit under 80C the house should already be constructed, and should be a residential property. The interest on the home loan is treated differently, and Section 24 deals with the tax aspect of the interest on house loan repayment. The maximum limit under this section is Rs. 1,50,000 and you don’t have to actually live in the house to claim this benefit. The interest payment is deducted from your taxable income and thus reduces your tax liability. There is no limit on the number of houses you can claim this as well as the location of the houses. The only limit is Rs. 1,50,000 on the whole amount. 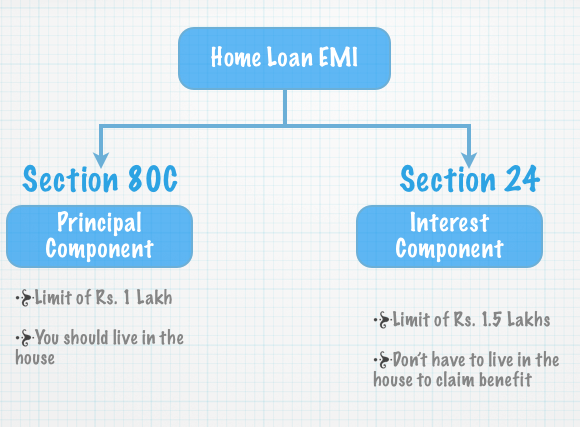 There are special conditions like when you get the loan disbursed before the construction of the house and pre – EMI interest and Raag has covered these aspects in a lot of detail in his post about tax benefits of a home loan which you can read if you were interested in those details. Can anyone explain the exemption part with an example ? Rohit – it’s in the post I linked to at the bottom of mine, it has a lot of details and you can go there and check out the examples. I don’t want to duplicate some of the excellent work that Raag has already done in that post. Great – thanks. This and more details are present in the post I linked to so that’s recommended for further reading. I have only one house and that is let out, so can i claim deduction more than Rs. 1.50 lacs? An employee can claim maximum Rs. 1,50,000/- tax benefit under section [24b] or which ever is less on self occupied house well if he owns another house and declares rent and has a house loan repayment for the second house also after considering the muncipal taxes paid and a standard deduction of 30% towards repairs and renewals he can claim rebate on the interest repayment which is unlimited but my question to you is, is it over all limit of Rs. 150,000/- for both houses or in addition to this 1,50,000/- for self occupied house can he claim rebate on the second house please clarify. Dear Sir, Please advice if there’s tax benefit, if i am living in a rental apartment ? I can’t think of anything besides the HRA thing – that you would be aware of I guess. Cud u please explain HRS ? There is a section 80GG which gives you deduction on rent paid for residential accomodation if one is not entitled for any HRA benefit from employer or a rent free accomodation. Can a gov.servant avail benifits of accrual basis of HBA interst .because in haryana HBA taken from department ist principal amount taken then interest amount.Is principal amount bifuricated in 80EE or under section 24+80cc. I have a home loan account jointly with my wife as co applicant. My wife does not claim any income tax benefit. Shall I get only 50% benefit U/s 24(i). If your wife is earning and files her income tax return, then yes you can claim only 50% benefit u/s 24(i), but if she’s not working but is only a co applicant as she’s the joint owner of the house, then you can claim 100% benefit. 1. If we are paying an Interest of 2, 80,000. Can I claim Rs. 15 L income tax benefit and my husband 1.3L tax benefit. -EMI payment also goes from the joint account. Net Income / (Loss) from House Property	which includes 1.5L of interest as max. Ownership of the house makes one eligible for the tax benefits that can be claimed by an individual but in case you are just a co-borrower and not the co-owner in a joint loan then tax rebates cannot be availed by you. Conversely if the co-borrowers are co-owners of the property then the tax rebate will be available in the proportion of their share in the loan. Hence repayment capacity of each co-borrower should be considered before deciding on the share of a loan. If the co-owners are equal owner of a property but if the share of a loan is 2:1 then the tax benefits will also be availed in the same ratio. If the person paying extra for repayment excluding EMI, let me know weather this repayment will be deduct from his taxable income. Yes smita, as paying extra amount reduces the principal amount of loan so this payment comes under the section 80C and you can claim benefit upto the overall limit of Rs 1 lakh. I have taken home loan of rs 20 lakh in which 5 lakh is margin money.can i get tax rebate for margin money like principle interest? Can you elaborate what you mean by margin money please? You are referring to downpayment.No you do not get tax benefit on downpayment amount since it is not counted in home loan. My wife and her widowed mother are co-owners of a property and are co-borrowers as well of the housing loan. However we don’t know what is the share of the loan for each of them. How can I know that? Further the mother retired in Oct 2010 and since then residing in the said property. All the EMIs till date have been paid by my wife from her account (however a prepayment was made last year by my mother in law). So can my wife claim 100% of tax benefit arising out of the interest paid. Finally thanks for the very informative post! The bank should provide that information surely, how else could you find it out? I can’t think of any other way. had a query with respect to the interest deduction. if money is borrowed for construction/purchase of house under construction, is there any deduction for interest during the construction period. or will it be aggregated till finish of construction and then allowed as deduction over the next 5 years? The deduction of interest payment during construction period is available only after the posession of house in 5 year equal installments. i have a flat at chenni, and i got retired on 30th sept2011 till retirement i was paying emi instaments from my salary. On retirement with my retirement benefits i have closed my housing loan fully. since i am bank employee i have availed my housing loan on funded interest method(principle paid first and then interest portion). am i eligible the this interst portion under sec 24 of incometax act , (i purchased the flat in the year 1997)and my instalment started in the year 1998 after mortorium period.kindly enlighten me. If you have availed housing loan from a notified institution then you are very well eligible for interest exemption.You can also verify from the institution as every bank.FI which gives housing loan also gives to the buyers interest deduction certificate. I need some explanation on the following. 1. My husband and I have taken a joint loan of 20 lakhs in Aug 2011, we both along with his father is the co owner of the flat. Will Me and my husband can get tax benefit or can only 1 avail of it. 3. Please explain the prepayment procedure or table of home loan. I have to pay prepayment charges o f 2 % to my bank if I prepay the home loan. Please assist me what can I do?? 2.Even if you prepay the interest component still remains the same.the strategy is more useful to reduce the EMI burden. 3.The prepayment charges are on the outstanding amount as on date. I had just gone for a Home Loan of 25 Lakh and flat is under construction. Could you guide me if I’m eligible for HRA and Interest Rebate(Under Section 24) both. I’m eligible for one out of two above? I have to wait for its completion until I can get benefits said above and how it will go then? You cannot avail both. Since the flat is under construction you can avail HRA benefit till you get the possession.The interest for construction period you can avail the deduction in five yearly equal installments once after you get the posession of house. To add further I had purchased this Flat on Down Payment basis means on 95% of payment is down to builder(Mine part and Loan part by bank). Only 5% plus other small charges needs to be paid after possession. If I have already paid the tax for the interset part of housing loan, Can I file a refund latter !? Yes you can claim refund when you file your ITR. If an NRI goes for joint homeloan with resident spouse and both are the co-owners of the house, then resident partner can claim tax benefit on the part of EMI and principal amount he has contributed towards repayement of the loan? To claim tax benefit what is the procedure? whether the loan EMI has to be paid through NRO account. What if the loan goe through NRE account and resident partner pays his EMI to NRI spouse by depositing in NRO account. Yes Resident partner can claim tax benefit towards repayment in proportion to the share in property. However, it will be good if the loan repayment can be done through partners account and NRI transfer the funds of his share.Otherwise, transferring the payment to other account does not make eligible for claiming housing loan tax benefit. I will buy a ready to move in flat during April 2012 using 80% home loan and occupy the same by Jul 2012 from currently rented flat. Can I claim HRA deductions till Jul’12 and interest amount rebate on home loan between Jul’12-Mar’13? You can claim HRA benefit till the time posession of house is not given to you. Any interest repayment during this period can be claimed in equal installments in subsquent years after the possession of house. Hence, tax benefit should be available. But i am still not clear how you got a loan on any property which is not in your name.? Dear sir.I would like to ask you that i am having LOAN FREE HOUSE. If i will take loan on this property for reconstruction/ maintenance, THERE IS ANY TAX BENEFITS ?? No sir, it is not second house.I have purchased it in cash. Next Next post: How is GDP calculated in India?